Muscovites go to the Tushino air show. Speech by amateur groups in Tushino airfield before the parade. At Moscow airport are ready for the holiday planes. Filmed pilots and parachutists, who will participate in the festival. 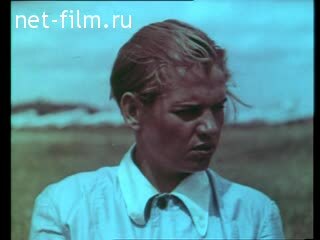 Among them are pilot-record Forestenko Ya, Hero of the Soviet Union, Moscow Chechneva known athlete M. Ratsenskaya, Major Frakin, Captain Lapshin, Colonel Shulzhenko and others. Field Tushino airfield before the holiday. Ready for the holiday at Moscow airport aircraft out at the start. Tushino airfield for a few minutes before the start of the parade. Among those present AI aircraft designers Mikoyan, AS Yakovlev, A. Tupolev, BI Rossinsky. Among the guests of the International Stalin Prize laureates world Heriberto Haar Eugenie Cotton, Joliot-Curie, the Turkish poet Nazim Hikmet and revolutionary. Arrive at the airport, party leaders and government: MA Suslov, PK Ponomarenko, LP Beria, GM Malenkov, AA Andreev, NM Shvernik, AI Mikoyan, AN Kosygin, LM Koganovich, KE Voroshilov, NA Bulganin, IV Stalin. Government members on the podium. Raised the flag of the holiday. Flypast at Tushino airfield open 25 aircraft-bearers. They fly in the fusion build planes, forming the words "Glory to Stalin!". The first branch of the holiday. Over the airport link sport aircraft, flight commander Vladimir Platonov in the cockpit. To the airfield suitable five sports planes Hero of the Soviet Union, Moscow Chechnevoy. M. Chechneva in the cockpit. Over the Tushino airfield pilots demonstrate coup with the reduction, loop the loop, barrel, etc. On the way - a new group of planes led by J. Forestenko. By Tushino close gliders Ratsenskaya group. Flying gliders over the Tushino airfield. The airfield new group of gliders, which are pilots Gusev, Yakubov and Chebotarev. Flying gliders in the air. During the anthem filmed designers AI Mikoyan and Yakovlev. The government platform IV Stalin, NA Bulganin and other leaders of the party and government. The second branch of the air festival at the Tushino airfield. Major and Captain Lapshin Fokin demonstrated flying on windy courses. On the approach to the airfield five jets. Group is Colonel Babaev (filmed in the cockpit). Five demonstrates aerobatics over the Tushino airfield. Lieutenant Colonel Babaev commands pilotage (synchronously). Nine jet on the way to Tushino. The group leader Colonel Shulzhenko in the cockpit. Lieutenant Colonel commanding Shulzhenko pilotage (synchronously). Approaching a group of heavy multiengined ships. Flagship aircraft escorted jet fighters. Over Tushino field - column multiengined aircraft designed by Tupolev. Designer Tupolev at the airport. To the airfield suitable design Ilyushin jet bombers. Hero of the Soviet Union Colonel Dolgushin leading column in the cockpit. Pass the Mikoyan design jet fighters. At the airport - Designer Alexander Mikoyan. With Tushino field fly new cars design Yakovlev "Yak-12." From the airport rise helicopter design engineer Mile. The airfield amphibian design GM Beriev. In the air, sea plane "flying boat." The government platform airfield IV Stalin, NA Bulganin, LP Beria, KE Voroshilov and other leaders of the party and government. The third branch of the holiday. Long jump from a plane with a parachute. To the airfield aircraft approaching convoy Airborne. Lead column Colonel Shcherbina in the cockpit. The government platform airfield IV Stalin, NA Bulganin, LP Beria, GM Malenkov and other leaders of the party and government.